Next we have to implement the onKey method, which will be called every time the user presses a key. This will check the entered text if the entered username is already available inside our registeredUsers array and set the available variables value to false if the name is already registered, otherwise leave it at it’s standard value of true. 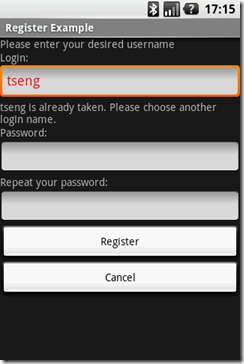 Lastly it will call OnUserChecked method, passing by username and it’s status to the listening function. This will cause an error, because we haven’t defined registeredUsers yet. 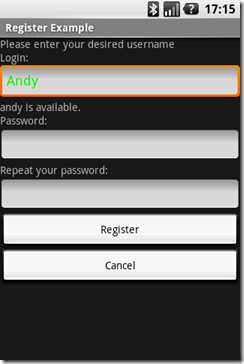 registeredUsers in our example is a simple String array, which will contain a few already registered names. 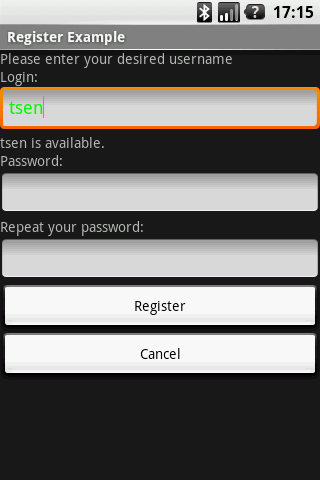 last but not least, we have to set and define the listener to our new CheckUsernameEditText widget. 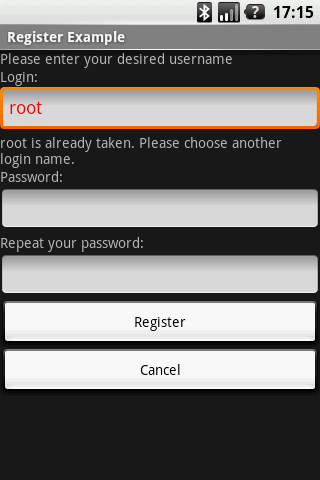 android:text="Please enter your desired username"
That’s all. I hope you enjoyed it. If you have any questions, post it in the comments.